Under the category of "who knew" falls green pork pozole. I've enjoyed red pozole. I've enjoyed it with chicken. But green? And with pork? That was a humbling and happy discovery I made late last fall while visiting the little City Heights eatery, El Borrego. 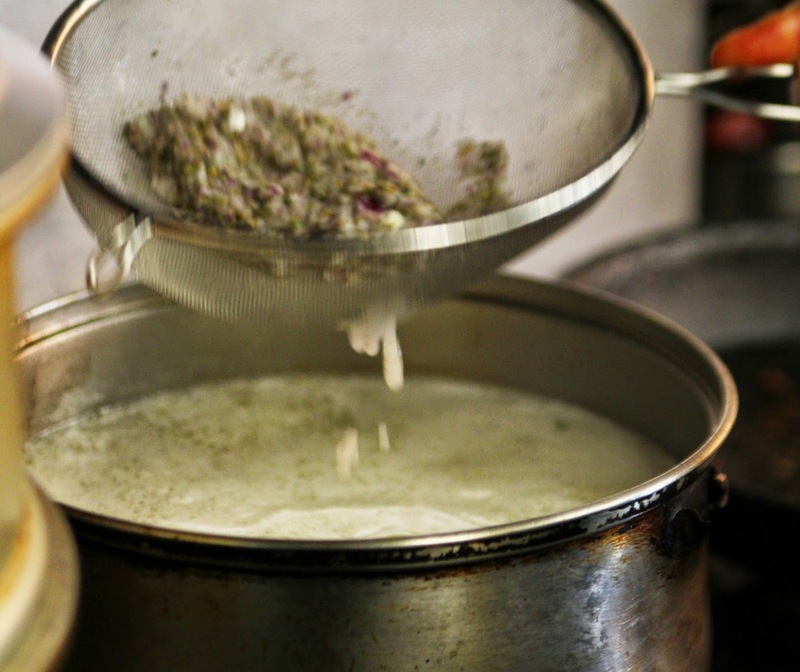 The broth is rich and herbaceous, thickened with the mandatory hominy. The chunks of pork shoulder are tender and meld beautifully with the broth and the various condiments you can add to the soup--from chicharones and cilantro to sliced cabbage and radishes. It's a meal meant to warm your insides in cold weather--but we're in San Diego so don't wait for a chill to set in. Turn on the AC and enjoy! 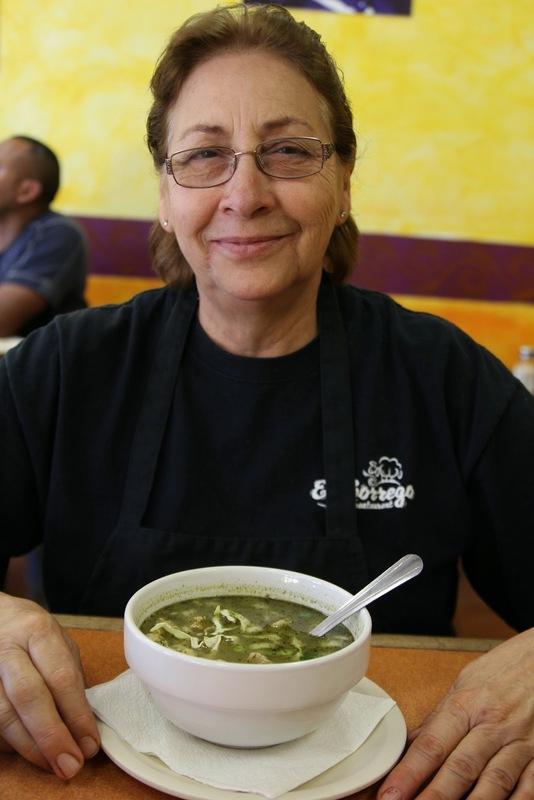 I asked owner Rodnia Navarro if she'd teach me how to make the dish and she, in turn, introduced me to her mother, Rosario Sotelo, who is El Borrego's chef. Rosario agreed and we decided to wait until after the new year to get together for a cooking session. By January I felt like that woman in the old Mervyn's commercial, feverishly tapping on the window repeating, "open, open, open." Well, the day finally arrived and as always, there were the unanticipated discoveries that I'm so excited to share. The first is that pozole is actually quite easy to make. The greater challenge is finding the ingredients. And that leads to the other discoveries. 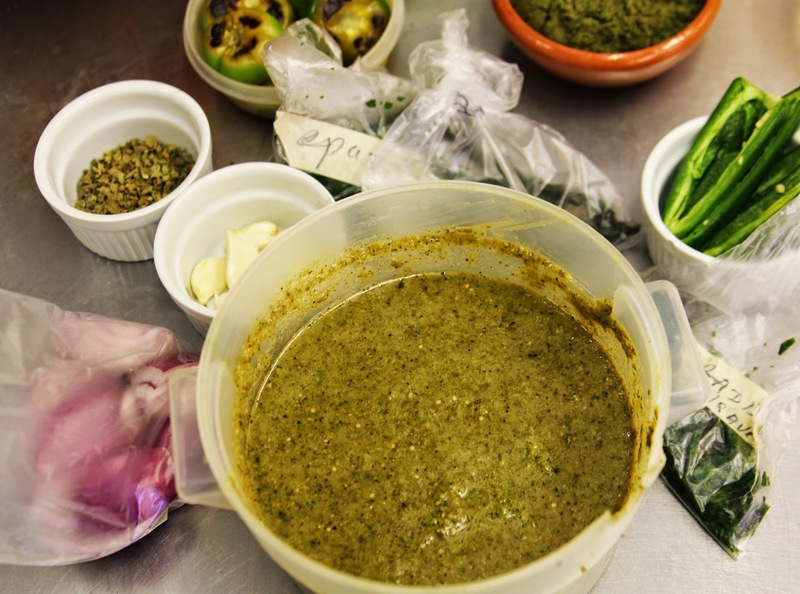 Green pozole gets its name from all the marvelous green ingredients it incorporates. The most prominent is pulverized pumpkin seeds. Look for them in Hispanic markets, but don't worry if you can't find them. You can buy the seeds whole and grind them in a good blender. You'll also need epazote, a weed-like herb that is usually associated with cooking black beans. It's pretty easy to find in Hispanic markets. And, you'll want Mexican Pepperleaf, or hoja santa. It's unusual tasting--to me it had a slightly bitter minty flavor. And, you'll want--get this--radish leaves. Yes, finally I've learned of a use for those beautiful leaves we tend to toss when we buy a bunch of radishes. And, Rosario, says, you can clip, wash, drain, and freeze these various leaves. 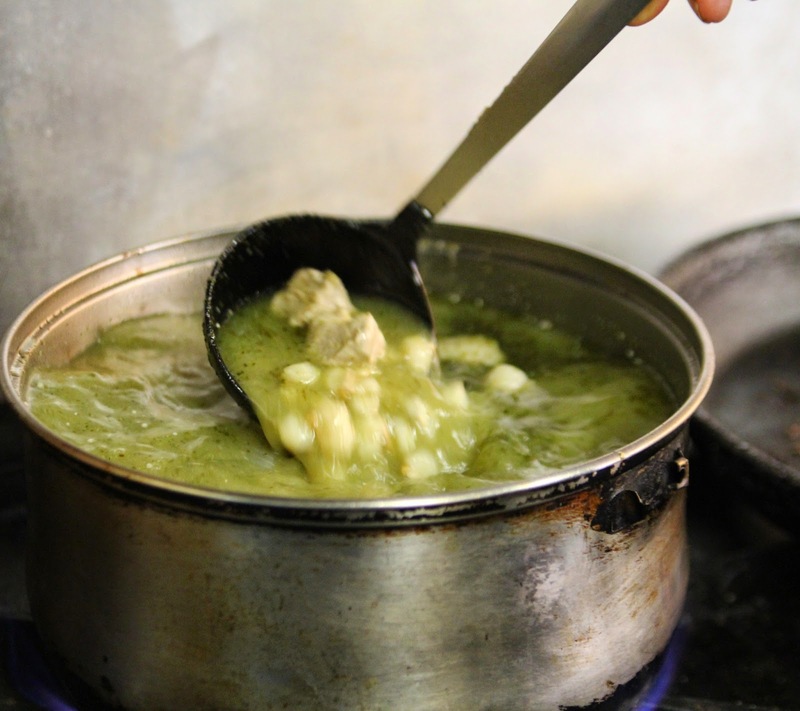 One thing I've heard a few people say about making pozole is that they bought the wrong hominy (which, by the way, is what pozole means). So, above is a photo of what you're looking for--oversized corn kernels, not grits. 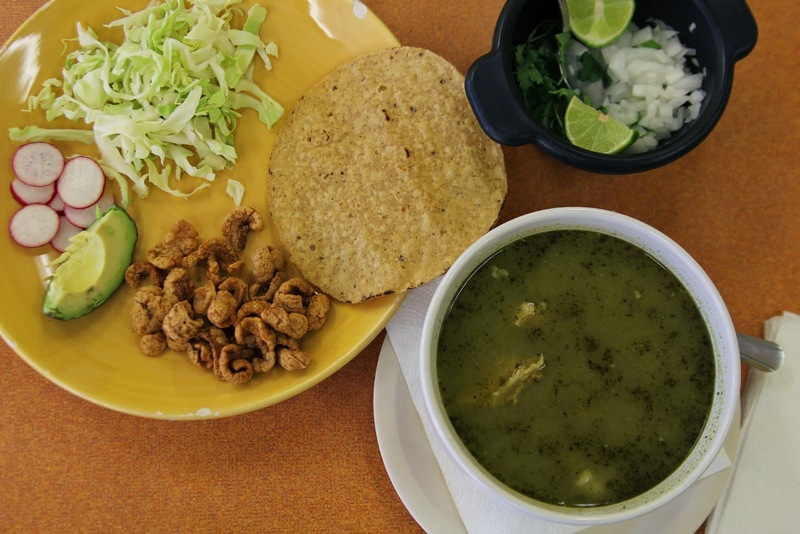 The pozole is atypical of the dishes you'll find at El Borrego--because the family is known for their lamb dishes. In fact, it's how they got started. Originally from Acapulco in the Mexican state of Guerrero, Rosario worked as a flight dispatcher for major airlines. 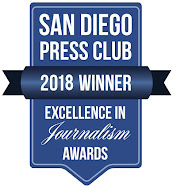 Rodnia, with a degree in international studies, worked at Frontera newspaper in Tijuana, where Rosario moved 25 years ago and opened a candy store. A natural cook, she also catered for a maquiladora. Rosario's sister had a convenience store in San Diego and a customer was looking for someone to make barbacoa, a method of slow cooking meat. In central Mexico, that typically means lamb. Rosario took the gig, and discovered that lamb barbacoa was not easy to find in San Diego. In other words, she saw a business opportunity. Rosario and Rodnia launched a little weekend business in the driveway alongside the convenience store, making use of the sister's licensed kitchen. 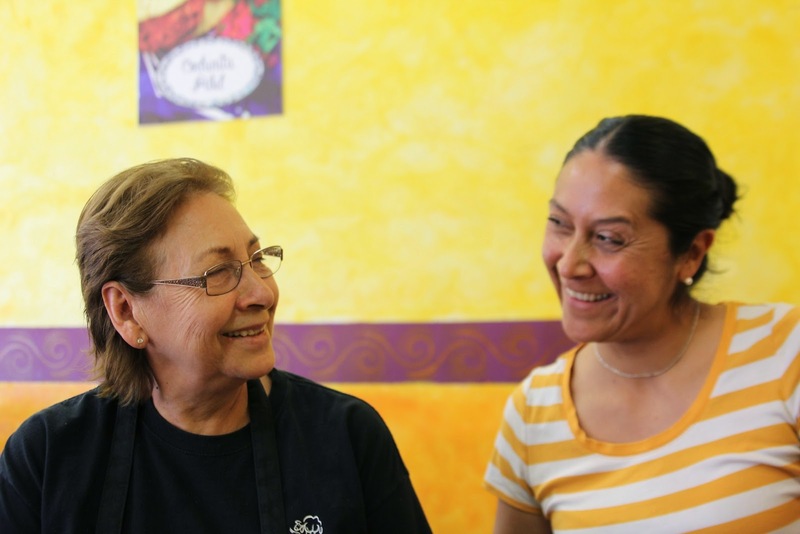 "Our first weekend we sold two tacos de barbacoa," Rodnia recalls. "Six months later we were selling 600 pounds a week in the driveway." 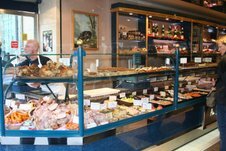 Customers referred to the irregular eatery as El Borrego, the lamb. "We said, 'huh?' But they told us, 'You are the borrego. You are the lamb,'" Rodnia laughs. For family reasons, the taco stand disbanded, but customers insisted that the duo open their own restaurant. And 10 years ago they did. The first four years went well and they were making plans to expand into other neighborhoods--until the recession hit. So they stayed put and expanded their menu to include what customers off the street were asking for--burritos and quesadillas and other more typical Mexican fare--at least typical to SoCal tastes. It allowed them to survive and now business has been improving as the economy and the neighborhood have improved. 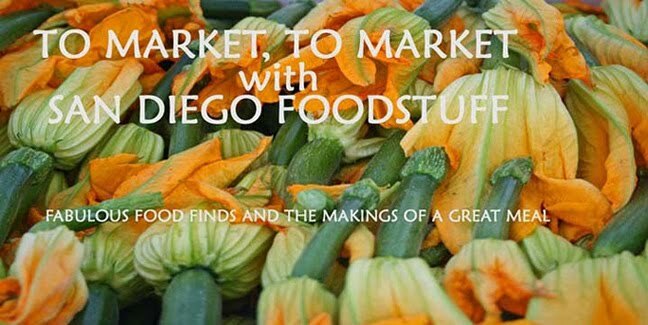 But, they're still known for their lamb dishes, including the lamb barbacoa tacos; sopes; and a fabulous quesadilla with squash blossoms, huitlacoche, and lamb. You can also buy lamb barbacoa by weight for parties, with all sorts of condiments included. The pozole, however, is a family favorite. Throughout Guerrero, including Acapulco, says Rosario, it's traditionally served on Thursdays, or what Rosario notes "Jueves Pozolero." She and her mother naturally started serving it on Thursdays, but have expanded it to include Fridays, Saturdays, Sundays--and rainy days. El Borrego has held cooking classes in the past and Rodnia is considering launching them again. But in the meantime, she says, "My mom cooks from the heart. We're proud to share our traditions." 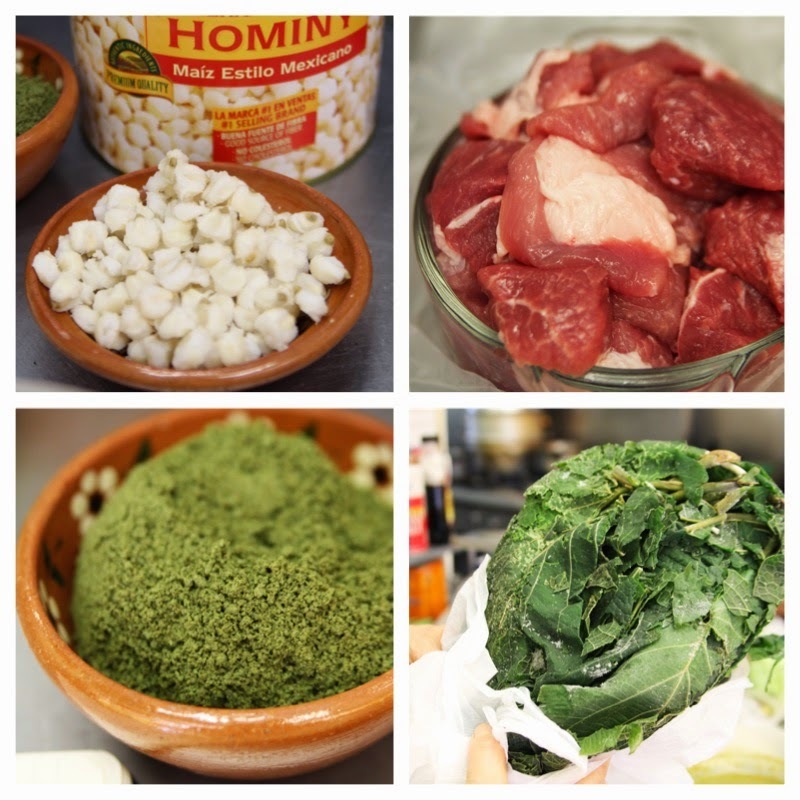 And that includes their recipe for green pork pozole. 1. Cut the pork into two-inch cubes. Add to a pot with water and salt. Bring to a boil, then simmer for 30 minutes. 2. Add the ingredients for Mixture 1 to a blender. Blend thoroughly. 3. At the 30-minute cooking point for the pork, strain just the liquid from Mixture 1 into the pork pot and discard the solids. Twenty minutes later add the hominy. Check the meat. It should be almost cooked. 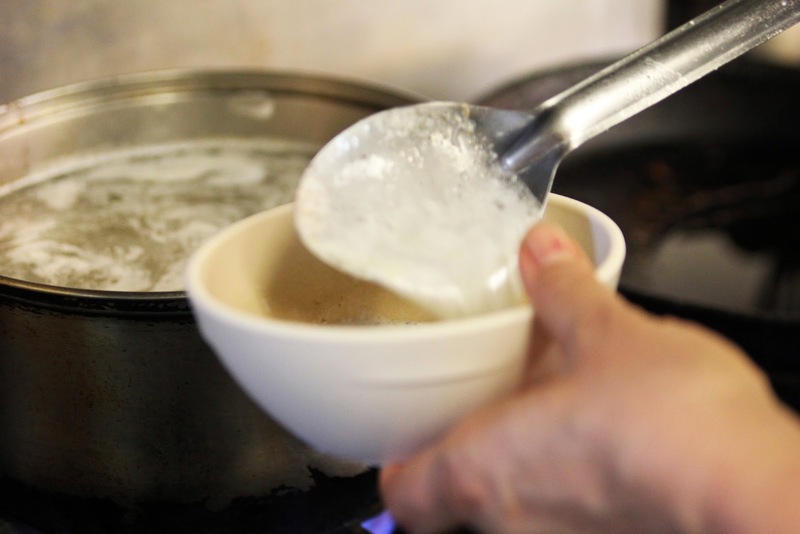 Throughout the cooking process, periodically skim the scum from the top of the soup. 4. Add the ingredients to Mixture 2 to a blender. Blend thoroughly. Heat a skillet and add the vegetable oil. Add the blended Mixture 2 to the pan and saute over low heat for about 10 minutes, stirring constantly. 5. About 10 minutes before the meat is tender, gradually add the sauteed paste to the pork pot and cook for 10 more minutes. Taste the mixture and adjust seasonings. 6. Serve the pozole with a variety of condiments, including sliced radishes, chicharones, sliced cabbage, cilantro, chopped onions, slices of avocado, lime slices, dried red pepper flakes, dried oregano, crispy tostadas, and mini roll taquitos. El Borrego is located at 4280 El Cajon Blvd.